× five = twenty Required Please enter the correct value. In Japan, stock market euphoria has taken hold. The Nikkei 225, the leading Japan stock market indicator comprised of 225 Japanese stocks, has already doubled since Prime Minister Shinzo Abe was elected into office in December 2012 and brought with him an aggressive regiment of monetary and fiscal stimulus. Abe has employed "Abenomics," a multi-pronged effort to reverse two decades of deflationary economic trends. But inflation has come in fits and starts. And recent Japanese history shows that the problems are firmly entrenched. They haven't by any measure been brought on by a lack of stimulative policy. The reality of the Japanese economy is much bleaker than the roaring Japanese stock market would have you believe. 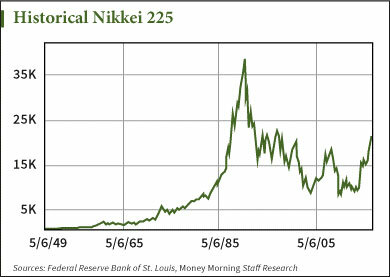 A historical look at the Nikkei 225 shows that even with this two-and-a-half year bull market, Japan still has yet to re-establish the highs it reached in 1989. In fact, it's still down close to 50%. I n the long-term picture, this recent "bull market" looks more like an aberration in what really is a 20-year bear market. It also shows that the Japanese stock market is highly bubble-prone. Even if Japan does make a march back to 39,000 – where it was in the 1980s – this is not the Japan of the 1980s. "Japan can never, ever ascend to the glory that it enjoyed in the 80s," Money Morning Chief Investment Strategist Keith Fitz-Gerald said in April. "Japanese businessmen that I talk to are a lost generation. There are very few of them that actually know how they're going to grow their way out of this." And that can be attributed to this next crisis in Japan. Japan's aging population is hampering productivity through a labor shortage and holding consumption down. As Fitz-Gerald said, "they've got the worst demographics on the planet." Stimulative monetary policy simply can't fill the void that the Japanese demographic crisis has created. In 2014, Japan ranked 208th of 224 countries in fertility rate. The current rate is 1.4 births per woman, according to data from the Central Intelligence Agency. "Wages are rising slower than the cost of living, which is compounding matters," Fitz-Gerald added. 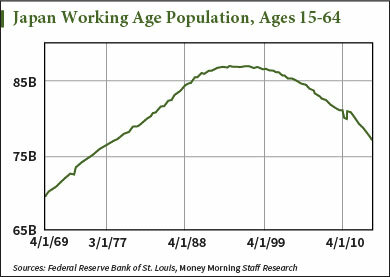 As long as the working population is shrinking, as are wages, consumption is going to continue to suffer. And the next chart shows that all of this is still the case despite the Bank of Japan throwing every policy tool it can at this crisis. This is a good thought provoking article. It stimulates your mind. Thank you very much. Is Abenomics the right economic policy for Japan? Is printing more money the answer to Japan's economic "woes"? The author stated, "While Japan's policies are feeding asset prices, the Japanese consumer remains starved." "…the Japanese consumer remains starved." ????? Are there long food lines in Japan to feed starving people? Is there high homelessness in Japan? Is there high unemployment in Japan like Italy, Spain, Portugal and Greece? None of the above. Japanese people are doing just fine. Somehow, IMHO, something is not right to the rhetoric going on discussing Japan's economic policy or Abenomics. What is Japan doing by re-embarking into quantitative easing, Abenomics? In plain language, it is competing against other countries in world trade. It must to remain relevant and competitive in global trade. U.S. is the leader. It leads the pack. Europe is also into quantitative easing in a big way, Draghi's asset bubble. It must because some countries are hurting badly like Italy, Spain, Portugal and Greece. Does Europe need a financial bail out? Not Germany. Japan forced Europe, in particular Germany, into quantitative easing by going back into it big time by Abenomics. Germany wouldn't have allowed the euro to lose its competitiveness against the yen. Germany would have come out on the short end, a big loser, in world trade against Japan if it did. Japan forced Germany to become receptive to the idea of quantitative easing for the euro. Abenomics started October 2012; Draghi's asset bubble March 2015, two years later. In the final analyses, it boils down to world trade. Japan, as a country, is doing the right thing for itself. Countries must to remain competitive. Oh yes. Forget the 2% inflation rate target. (Separate the noise from the reality.) Japan policy makers know what they are doing. They see what's going on in the U.S.
After all, Japanese people are pragmatic (they see what works) and most of all they are good imitators. They see, they copy.